Click on the link below to access the testing sites and schedules for students wishing to obtain their driver’s license. Posted in Buckaroo News on July 30, 2016 by The Buckaroo Blog. Posted in Buckaroo Jobs on July 29, 2016 by The Buckaroo Blog. 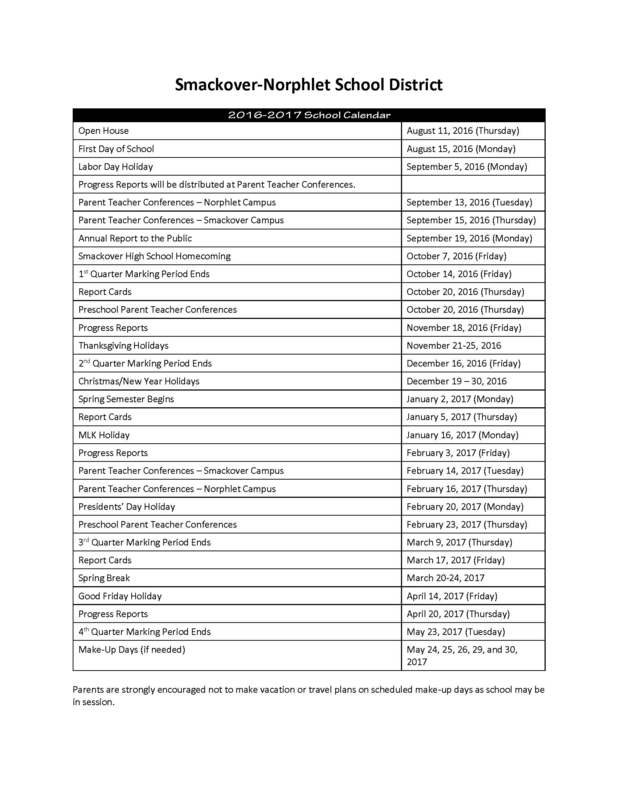 Two revisions were made to the 2016-2017 school calendar. The changes only affected the date progress reports would be sent home during the first nine weeks and the date report cards would be sent home for the third nine weeks. The updated calendar is shown below. For a printable version, click on the link below. Do you want to keep up with what’s happening in the Smackover-Norphlet School District? Posted in Buckaroo News on July 29, 2016 by The Buckaroo Blog. The Smackover Preschool has 6 paying slots available in the 3 and 4 year old classrooms. If you would be interested in one of these spots, please contact Debra Tolin at 725-1238. Further practices will be announced to the band on Thursday, August 4. Posted in Buckaroo News on July 28, 2016 by The Buckaroo Blog. Click on the link below to access the school supply list for Norphlet Elementary School for the 2016-2017 school year. As a convenience to parents, all school supplies are available for purchase at Norphlet Elementary School. This is not a fundraising effort by the school, but intended to help parents who did not want to purchase school supplies from a local retailer. The cost of supplies is the actual cost plus tax. Parents are welcome to purchase supplies through school or through the retailer of their choice. Posted in Buckaroo News on July 27, 2016 by The Buckaroo Blog. Sr. Football and Sr. Cheerleader pictures will be made Tuesday, August 9th, beginning at 4:00 p.m. in the Smackover High School indoor athletic facility. Forms will be provided to the players before the day of pictures. Please bring forms and money when pictures are made. Jr. High Football, 7th grade football, and Jr. Cheerleader pictures will be made on Thursday, August 11th, at the Norphlet Middle School Gym. Forms will be provided to the players before the day of pictures. Order forms and money should be turned in when pictures are made. Posted in Buckaroo News on July 26, 2016 by The Buckaroo Blog.